I had a crappy weekend. First off, there was the bad race at Great Illini where the temps soared over 100 degrees and my bike tires and shoes stuck in the tar. Apparently nobody received the memo that heat/humidity is my kryptonite. Second, I was struck with a full blown allergy attack that left my face swollen and haggard looking. SO, let’s get things back on the happy track and do a giveaway!!! WhooooHoooooo!!! Or should I say, WhoooooooHaaaaaaa! Whooha Gear has been one of my favorite retailers over the last couple of years. I have multiple pieces from them ranging from butter soft tees to a loose fitting hoodie that I wear everywhere. Good stuff (you can see my last post on Whooha Gear HERE). Whooha is a small women owned company offering products for other women athletes with the intent to help inspire other women. That’s a winning philosophy in my book! I have two items from the new 2013 line and I have several more things on my “wish list”. I picked up the “Regret Nothing” tee (Play Hard, Take Chances, Keep Smilin) at the Zooma Chicago expo. I haven’t seen this orange one online yet but they have it and if you want to call them, I bet they will get you one!! I’ve never been much of a t-shirt person but these don’t feel like traditional tees. They are soft, form fitting but not super tight and they move with me. I’m not only comfortable in them but love the message and designs. I have basically been wearing them around the clock which is why I don’t have a photo of me in the orange tee cuz it’s always headed to the wash when I’m not working or exercising. Do you want to win a Whooha shirt or hoodie? Whooha has generously agreed to give one winner their pick from the website. Yes, anything. You pick what you like and what fits your style! Go look around HERE and leave me a comment below telling me what you will pick if you win. If you would like a second entry into the giveaway, go like the Whooha Facebook page and leave a comment below telling me you did so and please provide your FB name for verification purposes. One winner will be drawn on Friday, September 6th at 9am. GOOD LUCK! And if you can’t wait to win, then please shop HERE using the discount code: INSPIRE for 10% off your order. Don’t forget to “Play Hard, Take Chances & Keep Smilin”! This entry was posted in "Run"Way Fashion, Cycling, Giveaways, Product Reviews, Running, Triathlon and tagged Bike Run, cool lifestyle tees for women athletes, Inspirational clothing, running tees, Swim, TRI tees, Whooha Gear, Whooha Gear Discount Code, Whooha Gear Giveaway, women owned company trying to inspire other women by tootallfritz. Bookmark the permalink. ohhhhh – I love the hoodies. I would have to pick one of the hoodies, either the Enjoy the Journey one, or the Miles to go one. I love Whooha clothes! I have the “I run because . . . ” hoodie, and I love it. It is one of my favorites. If I won, I would “Miiles to go hoodie with the Robert Frost poem.” Lovely. I would get the “Enjoy the Journey” hoodie. When I run I try to enjoy my surroundings and not think about any aches and pains I may have. I have also liked their Facebook page. “I may not be the STRONGEST, I may not be the FASTEST, but I will be damned if I am not trying my HARDEST” I love this saying on one of Whooha shirts. This is a great inspirational statement. Would love to wear this shirt at my next half marathon! k….done shopping. Absolutely LOVE the ‘Enjoy the Journey’ burnout hoodie. SO CUTE! Sorry you had a tough race. I hate the heat too. I love their stuff. I honestly don’t know which I’d get. I have one of their shirts already and its one of my favorites. I liked them on FB. If I won, I’d get the “I Run” black tank…great stuff! Will order if I don’t win!! I already like them on Facebook. Would love to win the “Enjoy the Jorney” burn out pullover. I was already a fan, but I left a comment on their page. Would looove to win! Thanks for introducing me to this site! Had never heard of it before!! I would love to win the Enjoy the Journey Long Sleeve Burnout Hoodie and I went and liked their FB page!! Thanks for sharing and for the chance to win!! I LOVE the blue tee that says “The woods are lovely, dark, and deep but I have promises to keep and miles to go before I sleep, and miles to go before I sleep”. Will be adding it to the wish list! Also liked them on Facebook! Name is Kari Hagenow. Man, I was hoping to read about an amazing race- I wish it hadn’t been to tough for you! As far as the Whooha gear, I”m (still) in love with the MIles to Go long sleeve burnout. I’ve loved that poem since before I even dreamed of lacing up running shoes! Soooo many choices, I really love the long sleeve thermal shirt, my favorite saying is “Trying my Hardest” I also love the “Enjoy The Journey” Tri-blend hoodie, OH and I really like “The woods are Lovely”………..I can’t decide!!!!! I already liked them on facebook!! I am torn between the trying my hardest T and the Enjoy the journey hoodie. I also liked their facebook page. I would pick the I Run Long sleeve burnout hoodie in purple. I like the Enjoy the journey hoodie! 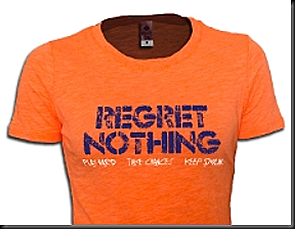 But I also like the Regret Nothing in orange! OK TTF…put it “crappy” in perspective…think of that Diane Nyad gal that finely fulfilled that mission she was on to swim Florida to Cuba. She did it, but when you look at her swollen lips and the look on her face…gotta wonder why one would want to endure such suffering. So…at least you didn’t end up with swollen lips…among other things…and as I last heard, Diane says she is finished with salt-water! Smart woman…maybe you and/or Whooha should send her something nice to wear! Love your posts and cool you do these giveaways…but Booha…. cause merchandise only for women! Cool stuff though. Don’t understand why everything for guys is so basic and boring! So next time you out there having tough times with the conditions at your race…praise God you can always find something cool to wear! Hopefully that heat will be going away soon and make you a happy camper. The heat really messes with us. I absolutely love the purple burnout hoodie that says I run. I run…burnout hoodie is FAB looking! Already liked their FB page. Thanks for the fun giveaway. Love! Toss up between the pink Mind over Matter tank and the orange Regret Nothing shirt you have above! And just liked their FB page too… Under Jordan Shrack. Awesome giveaway! I like the Enjoy the Journey tshirt. So many cute things on this page! I would love the Regret Nothing tshirt. It says it all. I would love the I Run…for Myself Form Fitting Burnout Tee! I love the “Miles To Go” hoodie! Also, I like Whooha on Facebook! I would love the regret nothing tank. I love the Miles to Go hoodie! Crappy miles make you tougher, but a bad race still stinks. I just liked the Whooha FB page…so please pick me. 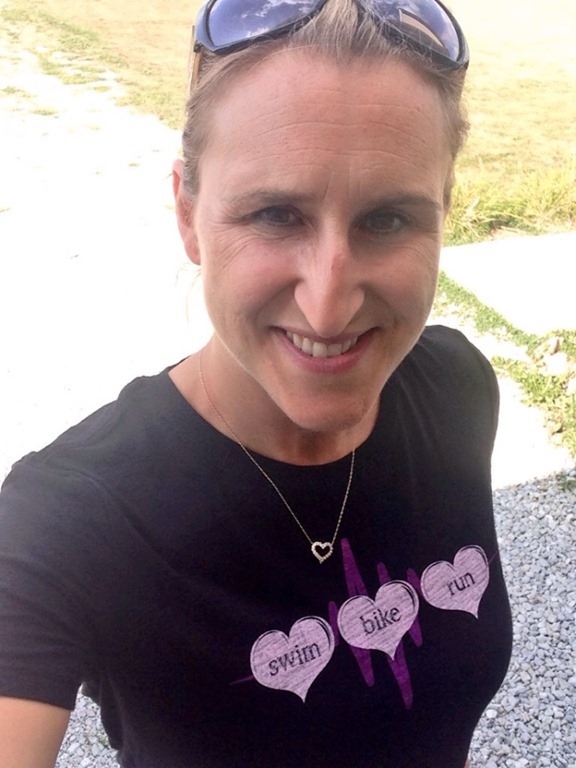 Even though I have plenty of running tops, I don’t have any triathlon tops, and now I am an official triathlete, just completed my 3rd triathlon on Monday, the Blackland Tri in Plano, Texas, so I would love to sport the swim bike run heart tee. I like the Enjoy the Journey long sleeved hoodie. Sorry about your crappy week. Hope it gets better for you! I love the Miles to Go long sleeve hoodie! Great giveaway! I think I’d pick the Enjoy the journey hoodie… but I really like that Regret Nothing orange tee… I see some shopping in my future! I LOVE the I run … for myself!! I would either get the hoodie, the slub or the form fitting. Love it so much!! I love the Enjoy the Journey hoodie! Hope you have a great weekend coming up. How do I even pick?? I love all the 13.1 stuff, and the purple I run long sleeve hoodie. These look awesome! I like the miles to go shirt. I like the I Run Slub Tee…black, purple and teal. Great combination! I’m letting them know on Facebook, too. Thanks so much! I would love a hoodie! Good luck racing this weekend. I liked Whooha on Facebook (Maggie Jalcovik). I would love the jersey tank I run… And the 13.1 not half bad sticker is pretty funny. I love the Regret Nothing tee! Regret NOTHING! Oh my gosh! LOVE LOVE LOVE the shirt. Likely I won’t win but I’ll wait to buy myself one until after your give away. Orange is “my team” color and the saying is oh so true. I am adding a link to this site with my favs for my husband for Christmas ideas. Thank you SOOOOOO much for sharing this great company with me. I have DEFINITELY been missing out! oh, and YES! of course I liked the page!!! I would totally get the “Enjoy the Journey” Hoodie! I likes their fb page and mentioned you too! 🙂 Thanks for passing this along…love it!